There has been so much anti-Semitism trying to hide behind anti-Israel speech that we have come up with a new headline to cover these stories whenever they arise, as they will with nauseous regularity. The title will be ANTI-SEMITISM HIDING IN PLAIN SIGHT because that is exactly what is happening today. The shame of spouting direct Jew hatred has morphed into dressing anti-semitism in the garb of anti-Israel or anti-Zionism venom. Advocating for a world without Jews is no longer fashionable, but a world without the Jewish State is trendy, particularly if it is dressed up as portraying the Palestinians, who are rabid Jew-haters, as victims. Add the slogan, "Free Palestine - from the River to the Sea" which advocates a world without the Jewish State, and you are well on your way to becoming the future fascists. Today, it's the collective Jew they are after as they pose in their morally superior narrative of human rights. So, from now on, my reports highlighting this racist crime will be headed by 'ANTI-SEMITISM HIDING IN PLAIN SIGHT. 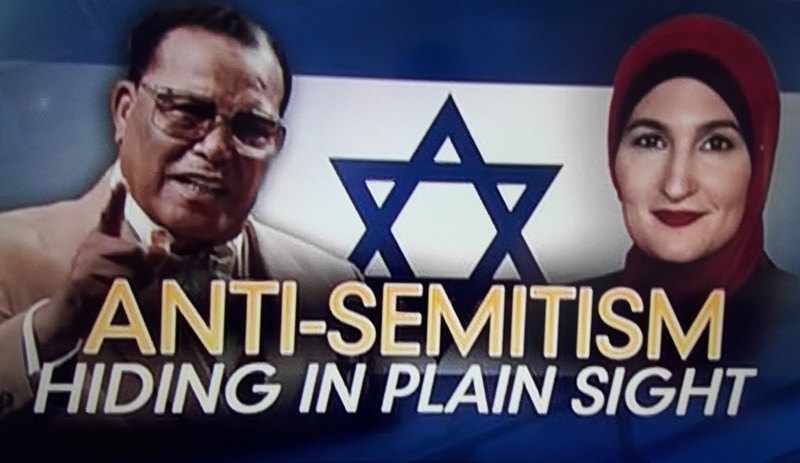 Linda Sarsour, ally of the rabid anti-Semite, Louis Farrakhan, calls for jihad in America. supports Sharia law, calls for the annihilation of the Jewish State of Israel, is held up as the darling of the feminist movement in America, and grotesquely supported publically by Jewish co-director of Code Pink, Ariel Gold, who said of Sarcour, "We have no greater ally in the Jewish community than Linda Sarsour." If Sarsour is the greatest ally of American Jews, then American Jews are in deep trouble. Sarsour is playing American Jews for fools, and there is no greater fool than Ariel Gold. The World against the Jews. The United Nations General Assembly is set to reject any Jewish connection to Jerusalem and its holy places. No doubt European nations will take the cowardly and immoral step and abstain. CNN Commentator, Marc Lamont Hill, shows his college miseducation by calling for the annihilation of Israel based on an "ethical and moral outline," whatever that means. He did it at a meeting of the United Nations and his remarks were met with wild applause. CNN fired him, but the damage has been done. Yet another under-educated "scholar, activist, and citizen" has opened his mouth to call for the end of the Jewish State. And in his moral superiority Lamont, no doubt, can see no wrong in his inflammatory words. Just three examples plucked from this week's news cycle. I'm sure there'll be more next week. Barry Shaw. Senior Associate for Public Diplomacy at the Israel Institute for Strategic Studies.